“What gets measured gets done!” – we have all heard this cliché, and most of us would admit that like most clichés it holds a kernel of truth.. The problem lies in determining if we are in fact measuring the right things. The traditional financial measures of a retailer’s health like sales growth, profit margin and cash flow are all retrospective and are mostly based on snapshots at a given time. Using these measures to drive your business is like using a photograph taken in the rear view mirror to guess where to steer your delivery van. It is far more effective to monitor a broad range of the metrics of your business on a continuous basis. Other indicators like personnel retention, illness in the workforce, customer service metrics and product sales and margin mix can have a huge impact on the achievement of your strategic goals. 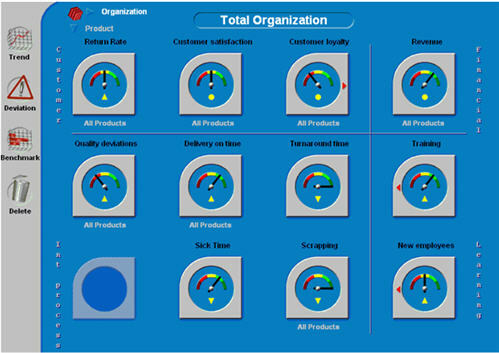 This concept of continuous and broad measurement is what is know as the Balanced Scorecard. The key to the balanced scorecard concept is that no single indicator is sufficiently broad to reveal how the entire retail organisation is performing. Rather each retailer has its own unique set of key performance indicators (K.P.I.s). For example the customer service related K.P.I.s of a value retailer might be very different from that of an up market department store. However, they would perhaps share similar targets in terms of return on capital or staff retention . These indicators are a reflection of the company’s strategic goals. If the targets for these K.P.I.s are achieved then the company’s strategy is being successfully implemented. A typical balanced scorecard contains four perspectives – Financial, Customer, Internal and Learning & Growth. The financial perspective measures the results that company provides it’s shareholders. The customer perspective focuses on customer satisfaction and market share. The internal perspective looks at the key internal processes driving the business and the learning and growth perspective focuses on human resource issues. What this list shows us is that a successful implementation of a Balanced Scorecard requires a judicious mix of strategic thinking and effective analysis tools. The organization’s strategy is broken down to objectives that are themselves broken down to specific measures for each business area. In a properly implemented system the link between each measure and the business strategy will be clearly documented and communicated. Given that retail is a constantly evolving area, it is imperative that any system can flexibly accommodate changes to strategy and measures. The issue of security is also important given that balanced scorecards will often include confidential data. A well designed system needs to allow for a flexible security system based on individual user profiles with multiple levels of security. The scorecard must be visible throughout the organization, so that the strategic objectives are clear to all employees. Each individual’s scorecard should be tailored to show his or her own areas of impact and the contribution that they make to overall objectives. The majority of the data that feeds the scorecard will probably come from your transactional systems or your data warehouse. Many companies begin by collecting, cleansing and storing relevant data from their central systems in a data warehouse. It is common for this to be the most challenging task in the entire balanced scorecard process. Williams also warns that “even a well designed data warehouse will probably not cover more than 80 percent of the data needed.” Some measurement may rely on data from external sources. Perhaps the most important factoring the success of a scorecard project is the quality of the analytical tools. Using software to automate the collection and presentation of information provides immediate, accurate and consistent feedback that can help focus activity at all levels of the organization. Software needs to be capable of trend analysis, benchmarking analysis, deviation analysis and ad hoc analysis. Trend analysis allows users to identify fluctuations and seasonal patterns. Benchmarking allows questions like “How is my store performing compared to my area average?”. Deviation analysis allows users to concentrate on the statistical outliers where time and attention will give the greatest pay back, and ad hoc multi-dimensional analysis allows users to gain insight from the huge volumes of data available to them. To achieve this users look for functionality that includes drill-down, roll-up, “dice and slice”, ranking and sorting. Williams believes that the speed of an implementation can be crucial, saying “slow deployments and lengthy implementations will invariably rob a scorecard project of vital momentum”. However, Gary Allen, Implementation Services Director at software vendor, Applix, warns “With any project you must not underestimate the impact of cultural changes, but this is especially true with systems whose end result is a modification of business behaviour “. Such a modification is indeed the end result in the scorecard concept. In a properly implemented system indicators are monitored continuously, and the end result is a feedback loop. Exception alerts lead to investigation which may in turn lead to corrective action. Eventually a new norm is created against which measurement is now undertaken. The concept of the Balanced Scorecard is not new – it was first introduced in 1991 by Kaplan and Norton in the USA. What is perhaps new is that the current generation of OLAP (on line analytical processing) software can at last provide the technological support to allow this concept to become a reality. We are all used to setting targets and being measured against them. Maybe the balanced scorecard can help us ask ourselves whether these targets are the right ones.